Hatters boss Nathan Jones doesn’t believe there will any extra motivation for his side this weekend when they face an Exeter City team containing defender Dean Moxey tomorrow. After Luton convincingly won 4-1 at St James’ Park back in October Moxey, 32, used his newspaper column with Devon Live, to say: “To add insult to injury, I didn’t much care for the way Luton went about things. “I guess they might argue the end justified the means, but it’s not the way we like to play the game and, truth be told, I’d love to see them come unstuck! Jones himself responded to those comments by calling Moxey a ‘keyboard warrior’ as he told the Luton News: “So to Dean Moxey, and I’m not worried about him calling us cocky and stuff, what I took liberty with or what he’s taken liberty is, is that he hopes we come unstuck. ““We don’t care who else does well or who does badly, we don’t look at it, what we do is concentrate on ourselves. 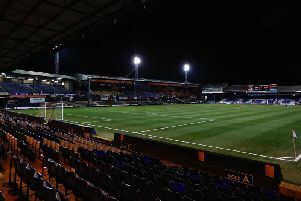 However, three months on, when asked if he thought it would act as a spur for his players for the return match at Kenilworth Road, Jones said: “I don’t know, but it won’t be a big thing. “I know Dean, he’s a good lad, a good pro, I think it was just afterwards, some naive comments, I’ve obviously commented as well, so there’s an element of naivety all round. “I don’t think we need any more motivation, I don’t think Exeter do. “The stakes are as high as they possible can be, so if you need any extra motivation then okay, but I don’t think so. One thing Jones wants his side to handle better this time is the threat of Grecians forward Jayden Stockley, who terrorised the Luton defence for the first half. He has netted 15 goals this season, including eight in his his last 11 games, as Jones continued: “We knew about just how he would play, we gave them information. “We’re as thorough a team as you will find in all of the lands of football, we can’t watch any more games, we can’t put any more clips and sort those out into a seven, eight, nine minute video, and say how teams play. “So we knew about it, it’s just when you give people information, they have to handle that. “Now we didn’t handle him well enough for the first 45 minutes, second half we did, and we nullified that threat, our threats came to the fore and we won the football game. “That’s what we have to try and do, that’s what we try and do every game, we try and nullify those by using the structure we have and then imposing ourselves on teams and it’s been reasonably successful so far. “So that’s what we’ve got to try and get to, not worry about anyone else, but concentrate on what we do, because we have wonderful players and we’ve added even more."